Review | "Uncle Boonmee Who Can Recall His Past Lives"
There is no more intoxicating director working in the world today than Thailand's Apichatpong Weerasethakul (known affectionately as Joe to his friends). His previous work has been on the radar of cinephiles for years (I still consider his 2005 masterpiece Tropical Malady to be one of the finest films of the last decade), but it wasn't until he took home the Palme D'Or at the 2010 Cannes Film Festival for his latest film, Uncle Boonmee Who Can Recall His Past Lives that the rest of the world sat up and took notice. There is a singular quality to Weerasethakul's work that cannot be mistaken. He is a man with a vision, a true auteur, each film bearing his indelible stamp, a kind of hushed beauty that seems transfixed in time, at once everywhere and nowhere, seemingly woven into the tapestry of life itself. 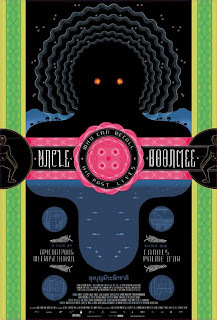 The could exist at any time in any place, and Uncle Boonmee is no exception, which perhaps more so than any of his previous work, exists squarely in a metaphysical world of spirits, reincarnation, and fantastical creatures that coexist with humanity in a strange kind of harmony. It is in this haunting mystical realm that we are introduced to Uncle Boonmee (Thanapat Saisaymar), who is dying of kidney failure. He requires dialysis several times a day, and knows in his bones that he only has 48 hours to live, realizing that his ailments are a result of bad karma. He has killed too many Communists in his life, he says, and nature has finally caught up with him. But the ghosts of the past still haunt him, and he is visited by the ghost of his dead wife, and his long lost son, who disappeared years ago and has returned as a bizarre half-man, half-animal. They have come to see him through his final hours as he reminisces about his past lives. But then on his last night he asks to be taken to a cave deep in the forest, a cave that feels eerily familiar, like something out of a dream; a cave he was once born in, many lives ago. Uncle Boonmee is not a film concerned with narrative. Weerasethakul is a director of feelings and textures. You do not experience his films on a surface level, because to do so would be a bewildering folly. He wants you feel something, to sense something in your bones, something elusive, something familiar. His films play like a dream upon waking, a kind of hazy hallucination pregnant with great, almost unknowable meaning. He reaches out and shakes you to your very core, and you walk away knowing you have witnessed something awesome and profound, even if you're not exactly sure what it is you saw. Weerasethakul incorporates a kind of magical realism in his filmmaking. Metaphysical manifestations of past lives appear like fragments of a dream, making us accept the impossible and perhaps even the ridiculous (monkey ghosts, amorous catfish) as something of great and powerful beauty. 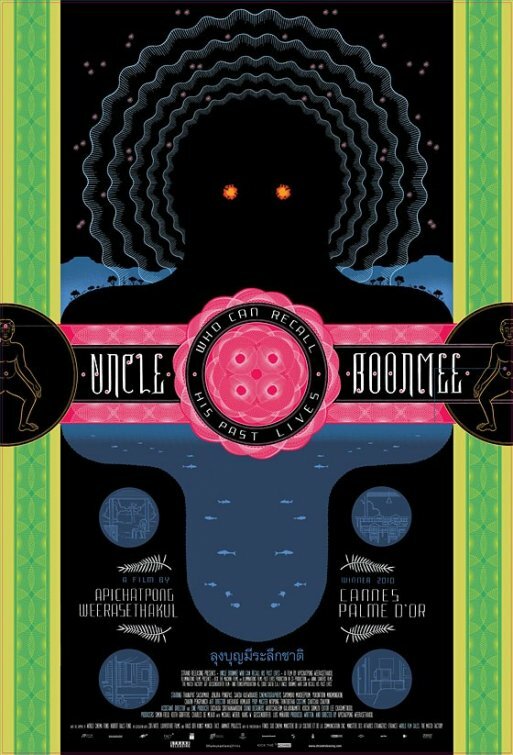 Uncle Boonmee's history is at once ancient, contemporary, and timeless. Like his best work, it exists outside of time and place and inside a world of dreamscapes both alien and familiar. Boonmee's head is full of stories of lives past, shards of memories collected into a foggy picture of time long gone, perhaps they are real, perhaps they are not. But upon his death, it all disappears, and his family is left almost detached from their own lives. Or is it the audience who is asked to step back and evaluate, transporting us away into a spiritual world all our own? Uncle Boonmee asks far more questions than it answers. It's almost as if Weerasethakul designed it as a Rorschach blot to be interpreted differently by each viewer. That is the magic of his films, and especially this one, which doggedly defies any kind of pseudo-intellectual explanation. It exists as a mystery, and a beautiful one at that. It's a sublime and wholly entrancing head-trip that is impossible to shake whose depths will still be probed by film fans for years to come. UNCLE BOONMEE WHO CAN RECALL HIS PAST LIVES | Directed by Apichatpong Weerasethakul | Stars Thanapat Saisaymar, Jenjira Pongpas, Sakda Kaewbuadee, Natthakarn Aphaiwonk, Geerasak Kulhong, Kanokporn Thongaram | Not rated | In Thai with English subtitles | Now playing in select cities.